Fair enough—to a point. After all, driven by resentment, “the social-justice left” now produces insidious rancor and division throughout the culture. For example, that whites are more successful (on average) than blacks is constantly used to support the belief that America is a racist society. Yet this only begs the question of how it is that both Asians and Jews have managed to be more successful (on average) than whites. Although plainly false, the conception of whiteness “as a sort of moral disease” that “oppresses people of color” is nonetheless pernicious. And this is to say nothing regarding the war on men, about which I have often written in this magazine. Shermer’s second sentence is problematic. To begin with, an America-first immigration policy is not specific to nativists. And nativism—that is, the policy of favoring native inhabitants as opposed to immigrants—need not be equated with xenophobia, racism, or what you will. Indeed, from Plato and Aristotle on, putting natives first has been a first principle of political philosophy, so obviously necessary as to hardly warrant justification. Asking a person whether he is justified in his nativism is about as rational as asking a man why he is partial to the interests of his wife rather than to any number of persons whom he has never even met. Given what people and nations are, such questions are not worth considering. Although the belief that immigration should be limited is clearly not the same thing as vilifying immigrants, still there is no doubt that some people—and those on the alt-right more than any other group—have indeed vilified immigrants. So, despite his facile notion of nativism, Shermer’s concern about the alt-right is certainly justified. That said, a clarification is in order: Despite racists such as Richard Spencer, Greg Johnson, and others, the concept of the alt-right, like paleoconservatism, was originally meant to distinguish its adherents (true conservatives, you might say) from the essentially liberal (or in some respects, even left-wing) universalism of the neoconservatives. Doubtless the concept is now tainted forever, so we non-racists should not identify with it, though one should have a historically accurate understanding of it. The one hard kernel of dogma that tends to separate liberals and conservatives today, and which reflects a clear deviation from the ideals of classical liberalism, is the prevailing emphasis on the group over the individual. Under the banner of identity politics, liberals tend to categorize individuals as members of an oppressed or oppressing group, using race, ethnicity, gender, sexual orientation and other crude categories as a moral proxy. Meanwhile, under the banner of faith and flag, many conservatives sort people into collectivities according to religion and national origin. The resulting Us vs. Them tribalism leads to such illiberal policies as speech censorship on the left and economic nationalism on the right. The racial politics of the Alt-Right is the moral mirror image of identity politics of the Alt-Left. Once again, Shermer gets the left right and the right wrong. He seems to think that economic nationalism is intrinsically right-wing, that it is “illiberal,” and that it has some sort of connection to “racial politics.” Utter nonsense! It’s true, of course, that economic nationalism is a position that is usually held by the right, but the reason is that, as we learn from Jonathan Haidt’s research, conservatives, unlike liberals, tend to conceive of politics in terms of the whole, our goods not reducible to mere individualism and rights. So we naturally value things like “flag and faith” more than liberals do. But nevertheless, economic nationalism should not be considered intrinsically right-wing; given what it means to be a citizen of a nation, it is merely rational, commonsensical, even. Anti-globalism—tellingly—comprehends right and left alike. It’s somewhat misleading, moreover, to say that conservatives “sort people into collectivities,” because people themselves are already sorted, given the varieties of history and culture, of taste and sensibility. We conservatives take that into account, and some of our views are shaped accordingly. No conservative, for example, ever had any illusions about exporting democracy to the Middle East, as if human beings were so many interchangeable machine parts. That was a liberal/neocon folly. Further, we conservatives know that the very classical liberalism Shermer prizes owes much to the respective civic nationalisms of Enlightenment Europe. Nor do we believe that through some magical faculty—Reason, Tolerance—the incompatibility of human values and interests (“diversity”) can be overcome. Anyone who thinks economic nationalism is a matter of “racial politics” should read Daniel McCarthy’s recent New York Times op-ed “The Case for Trump’s Tariffs and ‘America First’ Economics.” McCarthy’s argument, to my mind quite reasonable, has nothing to do with race, let alone with racism, and indeed, nationalism in his sense is not “illiberal” but aims to promote liberty. After all, liberty without prosperity comes to very little. Having made a straw man of the right, Shermer goes on to give us what he thinks is a kind of wise medium between two extremes. It is a typical example of the often illusory reasonableness on which centrists pride themselves. Classical liberalism provides an escape from this dyad, because it identifies individuals, not groups, as the locus of rights. It is individuals, not groups, who perceive, emote, respond, love, feel, suffer—and vote…. History shows that it is when individuals are treated primarily as units of a larger group that abuses of freedom are more likely to occur—sometimes in a way that leads to dictatorship or even bloodshed. It is when people are judged not by the content of their character but by the color of their skin—or by their gender chromosomal constitution, or by whom they prefer to share a bed with, or by what accent they speak with, or by their political or religious affiliation—that liberty fails, and mobs form. Far from providing “an escape” from our present troubles, there is little here besides egregious confusion and vague sentimentalism. Shermer is correct that classical liberalism “identifies individuals, not groups, as the locus of rights,” but the distinction he makes between individuals and groups is tenuous, and he is much closer to the left than he realizes. In politics—in contrast, say, to the legal domain—people are generally “treated primarily as units of a larger group.” Otherwise there could not be a polity at all. It is only individuals who vote, but in so doing they are voting for persons who purport to represent the interests of “a larger group,” Republicans, or Democrats, or union workers, or senior citizens—whatever the case may be. Of course, “political group identity” should not “negate the status of the individual as the primary moral agent, the inheritor of legal rights, the baseline actor in democracy, and the ultimate subject under our laws,” but it’s quite ignorant of Shermer to equate that negation with conservativism, as though it were the alt-right. Implying that “conservatives” need to come to “terms with the common humanity we share with those in other nations,” Shermer falsely takes it for granted that conservatives are racist or xenophobic by definition. Besides, a man who so tritely invokes Martin Luther King Jr. would do well to know that, like Booker T. Washington Jr. before him, the great civil rights leader was strongly against illegal immigration (and overmuch immigration period) because he knew that it dragged down wages for native workers and made for fewer jobs for black Americans. 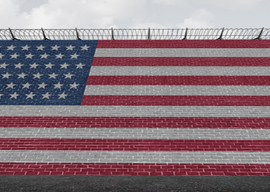 In their “Low-Skill Immigration: A Case for Restriction,” Amy Wax and Jason Richwine make a robust argument for limiting low-skill immigration for the sake of the national good. Such a position does not entail that one lacks awareness of “the common humanity we share with those in other nations.” It does presuppose a truism, namely, that the United States is a country, and not a global utopia. Mobs form for many reasons, including not just the failure to perceive people as individuals, but frustration with the elite’s neglect of the national good. And from the French Revolution to our current populist turn, that is eminently an economic issue. In context, therefore, Shermer’s opposition to economic nationalism is rather ironic.